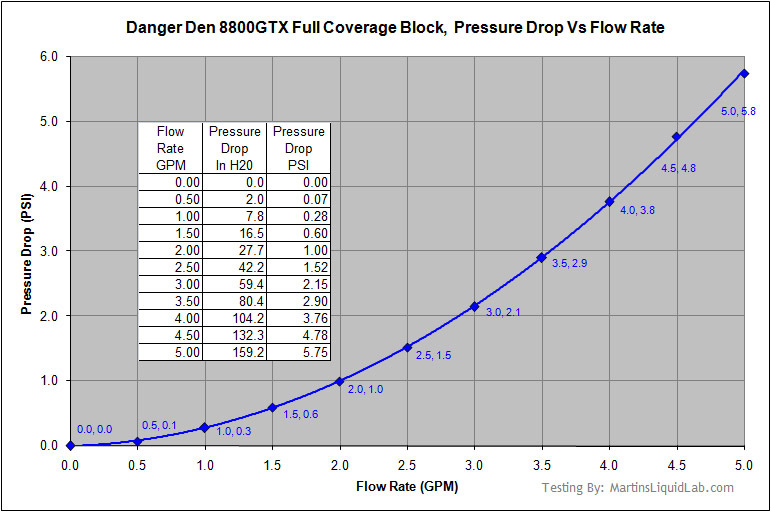 Welcome to my pressure drop testing of the Danger Den 8800GTX full coverage waterblock for the 8800GTX video card. 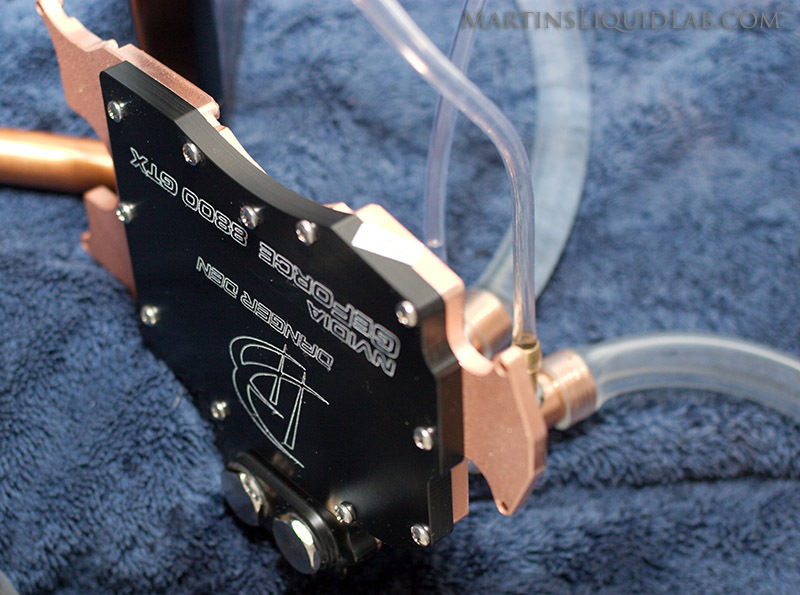 This page will focus on the pressure drop and flow characteristics for this waterblock. The block is a finely CNC machined block of solid copper, no add on aluminum pieces, just pure copper, a nice complete gasket and a very durable black Acetal/Delrin top. The most scientific way to determine a blocks hydraulic resistance is to test pressure drop. Pressure drop is a measurement of pressure loss across a block that varies with flow rate. This is basically a measurement of energy loss, and directly influences how much flow rate you will have. Dwyer Digital Manometer 475 Mark III - Accuracy .5% of Full Scale. Range 0-200" W.C., Resolution .1" W.C.
And if you're not familiar with what this means, I'm providing a relative chart below with several GPU waterblocks. For increase flow rates, the lower pressure drop results will net the best flow rate results. This is important for users with multiple block loops, as you need to keep an eye on flow rate and make sure you don't install too many high restriction blocks in the same loop to the point where flow rate is lowering to the point where your other blocks or radiators in the same loop begin to loose some thermal efficiency. 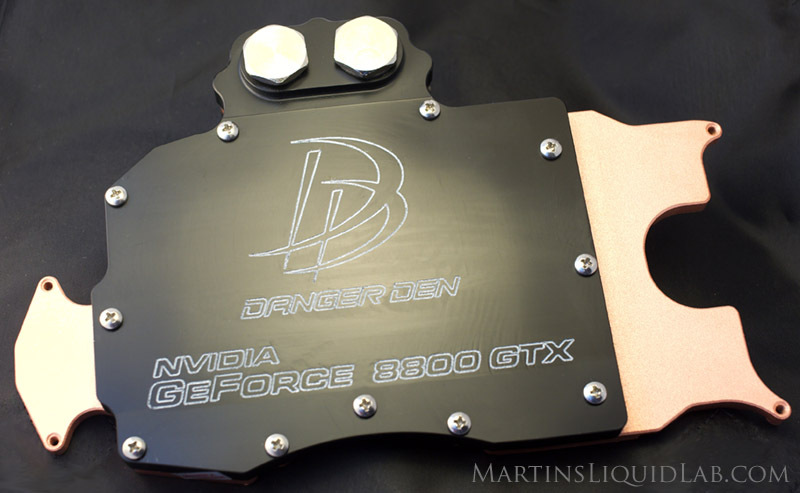 The Danger Den 8800GTX is a very low pressure drop graphics card block, the lowest restriction full coverage water block I have tested for the 8800gtx so far. This will be a fantastic waterblock for users with multiple waterblocks connected together in the same watercooling loop. The low restriction will translate into high flow rates for other critical components in multiple block loops like the CPU, Chipsets, or additional video cards. 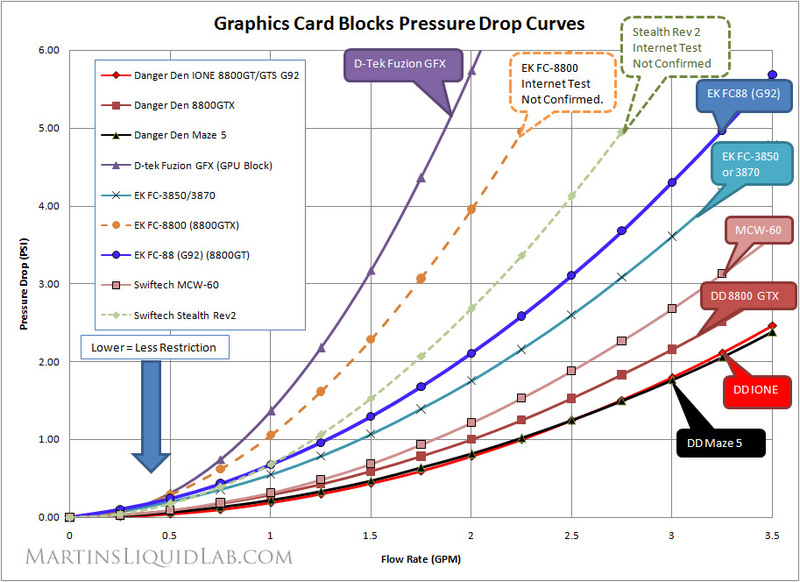 I'll give it the crown for the MOST FREE FLOWING FULL COVERAGE 8800GTX WATEBLOCK!